Permanent resident status can be obtained by New Zealand citizens in different pathways. In addition, for many, permanent residency is a necessary requirement in order to obtain citizenship in Australia. When New Zealand citizens arrive in Australia, almost all are granted a temporary visa called the Special Category Visa (subclass 444) automatically and electronically, and may not be aware of this. Simply by presenting your New Zealand citizen passport and incoming passenger card to immigration clearance you are deemed to have applied for the Special Category Visa. Since 1 July 2017, many New Zealand citizens may now be eligible for permanent residency under the new Skilled Independent Visa (subclass 189) (New Zealand) Stream. 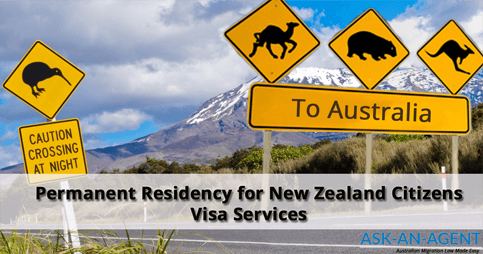 Why would New Zealand citizens apply for permanent residency in Australia? The New Zealand Stream under the subclass 189 visa enables New Zealand Special Category Visa holders to apply for permanent residency. meets mandatory character, health and security requirements. Are there other ways that New Zealand citizens can obtain permanent residency in Australia? Yes, but the Skilled Independent Visa (subclass 189) (New Zealand) Stream is the easiest. I am a New Zealand citizen. When can I apply for Australian citizenship? The requirements for citizenship in essence depend upon whether you arrived in Australia before, or after, 26 February 2001. If you arrived in Australia prior to 26 February 2001 then you may be eligible to apply for citizenship. Alternatively if you were not in Australia on 26 February 2001, but you have spent at least 12 months in Australia during the period 26 February 1999 – 26 February 2001 on a Special Category Visa then you may also be eligible. If you arrived in Australia after 26 February 2001 then it is likely that you would need to obtain permanent residency before being able to obtain citizenship (as well as access the various benefits which come with permanent residency referred to above). Accordingly, you may wish to consider one of the above pathways to permanent residency first. For example, New Zealand citizens who are granted a visa under the new pathway provided by the New Zealand Stream under the Skilled Independent Visa (subclass 189) can apply for citizenship after 12 months.